Music is a major part of our lives. It’s the same for many seniors too. But, listening to music today gets difficult with complicated electronic devices that stream music. But for many seniors and elderly, basic players might be a better option. You know, old fashioned (? )devices like Walkmans or other portable handheld CD players. With these music players,the users can quickly pick their favorite songs and artists. And the simple controls (usually just play, pause, skip, rewind, or volume) are easy for them to understand and use. 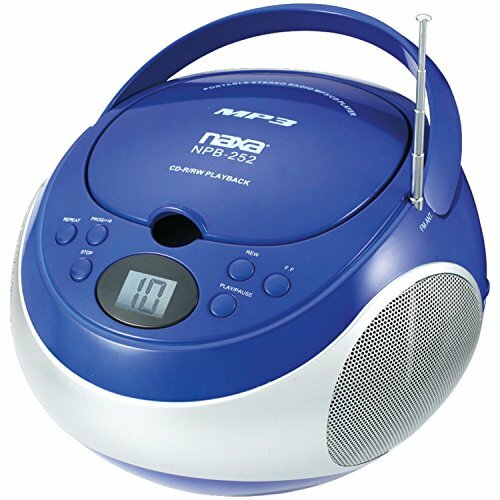 Another type of easy to use CD player for seniors to consider are ones that have speakers. These are a great choice for seniors who want music in the background – or want to listen to it LOUD! Some of these also have radio or alarm features which are helpful too. Either way, a large button CD player for senior citizens will be easier to see and simple to use. Keep it simple and they will have no problem using electronic devices like these. 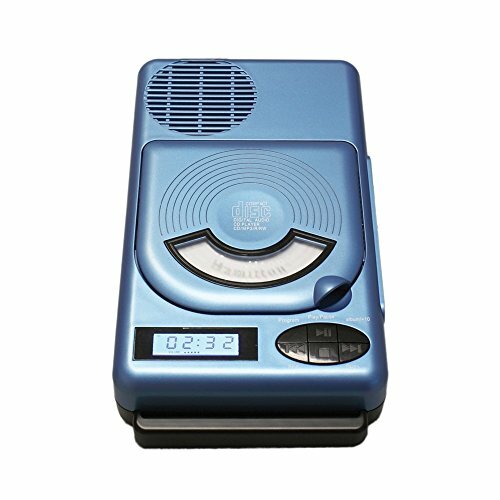 Looking for a simple CD player for an elderly loved one? Read on to see some of the best CD players for the elderly, including both portable and speaker types. I looked at nearly 100 options but many of them had buttons that were too small, print you couldn’t read, or were too complicated to use. The main advantage of portable CD players is that they go anywhere you go. This is a nice option for a senior who likes to take walks, exercises regularly, etc. These devices are smaller in size though and might not be the best choice for seniors with hand pain, arthritis, or other problems in their hands or fingers. In that case, move down to the CD speakers section. The HOTT CD player is my favorite portable model. See those large buttons? Notice that they are actual buttons and you can feel the click when you press them. They also have contrasting white print on a black background. This makes the functions easier to see. This is a bestseller on Amazon probably due to its shockproof protection. This is a useful feature for seniors who may drop the player. This feature reduces damage to the player and the disc if this happens. In addition, it has a readable large LCD screen, simple standard controls, 5 sound effects, and 4 playback modes. It even comes in several color choices for all the personalization you’d need. This is particularly useful for seniors whose hearing may need a little extra support (more treble, less bass, etc.). It supports most audio formats including CD, CD – R, RW, MP3 and WMA audio files. WIth 45 second anti-skip protection, you won’t have to worry about your music being interrupted either. AC/DC power cords are included. It does come with ear bud style headphones. These may not work well for seniors with hearing aids. So, you might need a pair of aftermarket headphones. I have some recommendations for you here. I wanted to give you another, lower priced option and found this one for you. Most of the cheaper CD players have small buttons or bad reviews but this one is a good compromise. The buttons aren’t as large as I would like but they are tactile and have a nice crunch to them. They standout well against the gray background too. Unless the user has serious vision problems, they should be able to see the buttons ok. This player also has 40 second anti-skip protection for seniors who exercise or like to take walks. Seniors will also love the large, easy to see LCD display. This screen shows a low battery indicator, volume control, and what’s playing at just a glance. It does need 2 AA batteries (not included) for music on the go. And, if you want to plug it up at home or in the car, you will need to buy a separate AC/DC adapter for it. If you think you or the senior in your life would rather have a speaker system that plays back CDs, here are some of the best. They all have nice large, easy to use button controls and great sound quality. First up, this top loading CD player has everything you’d need in a player with nice and simple buttons. Although, the print on them isn’t as clear as I’d like. It’s also fairly lightweight compared to the others on this list, so it can be moved around if needed. The look and style is familiar to many seniors – it looks like the cassette players from the 70’s. It supports CD, CD – R, RW, and MR3 files with a USB port, so you can get your favorite music from pretty much anywhere. With a backlit LCD track display, anti-skip technology, 1/8″ and 1/4″ stereo outputs, and a built in 3W amplifier/speaker, you’ll get a lot of versatility out of this device with complete control over your music and how you listen. Batteries are sold separately, however. The wall (AC/DC) power cord is included. This top loading CD/MP3 player is a bit more traditional than the option above. The CD loads in the top. Below that is a speaker that can fill up the room with your favorite music. An AM/FM stereo radio is also built-in. You can take it with you to whatever room you’re in with the built-in handle. With large, tactile buttons including program, skip, pause, and repeat functions, it’s very intuitive to use as well. It also comes in red. But, I think the print is easier to red on the blue model. Although, you could read the print easier if it was larger. 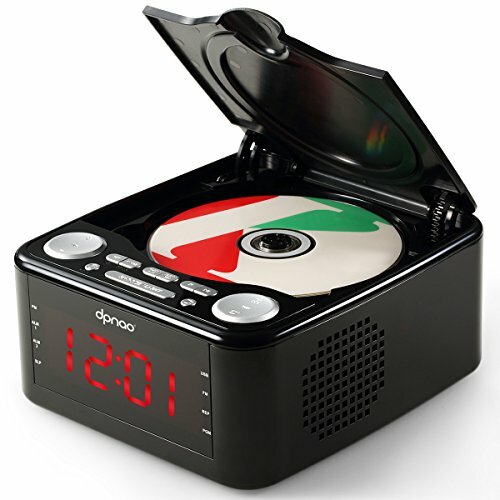 Finally, this dual-capability radio, alarm clock and CD player is a versatile little device. This model gives seniors many different options for listening to music. 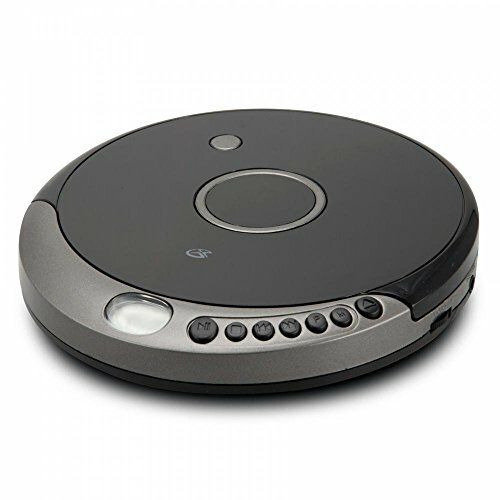 In terms of the CD player, it has large, easy to use button controls. There is also repeat function if they get hooked on a favorite song! The built-in speakers are high quality but there is also a headphone jack for private listening. There are many ways you could listen to your favorite music with this versatile device. It’s also a clock, alarm clock, and FM radio player with 10 presets. It will even charge your cell phone through the USB port. It’s a great option for dementia patients too with its preset and repeat functions. There are several things to look for when shopping for a CD player for an older person. Options like these will make the player simpler to use for older eyes and aging hands. Large Buttons. You’ll want to find one with large buttons that are easy to press. I also suggest “tactile” button meaning buttons that you can feel when they move. That slight crunch when you press the button lets you know it has been pressed. Oversized Print. Look for big, bold letters on the player itself as well as the buttons. If there is a digital screen, it should have large letters and numbers too. Digital Screen. For players that use a digital screen, it should be bright and easy to read. Back lit screens are helpful doe making small print easier to read. Simple to Operate. For less tech friendly seniors, choose a basic CD player. Just basic buttons like play, stop, rewind, and forward. Stay away from complicated nesting menus and touch screen operations. Headphones. Don’t forget to look close at the headphones. They should be hearing aid compatible for hearing aid wearers. Think about ear buds vs over-the-ear headphones too. I have a guide to lightweight headphones for seniors you can read by clicking here. Overall, big buttons, an easy to read display, and versatile functions and uses are what makes a music player for elderly people the most useful for them. Check out this article too to find the best pair of headphones for seniors and the elderly. 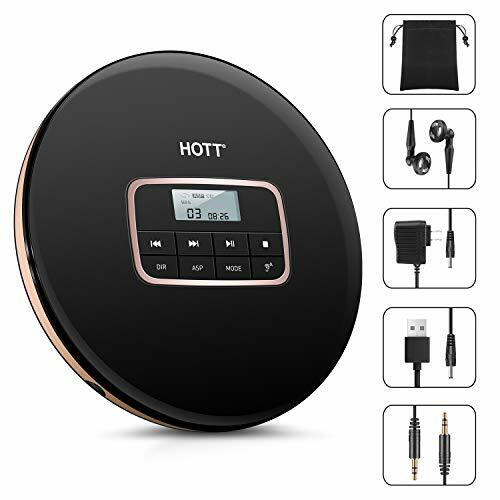 My favorite is the HOTT personal CD player above but your choice will depend on your needs and what you want out of the device. Check out these MP3 players too for more music playing options for seniors. Did you find this guide helpful? Share on your social platforms with friends and family, and feel free to leave any comments or questions below! Scott, thank you for the information about these CD players. We are looking for something simple for my elderly father, whose vision is being affected by glaucoma. He has some memory issues as well, so I appreciate the information you have provided here. Thanks! My experience with my elderly mother is that she is able to follow linear instructions, but gets lost whenever there is uncertainty in the instructions. So, any CD player with a button that switches between CD and FM and AM is a disaster because she does not know whether to push the button. So, a CD player needs to stay a CD player all the time. I’ve taped over most of the buttons on her TV remotes. Hi Mark – thanks for your contribution and comment. I’m sure this advice and experience will help others who are shopping for a CD player for their senior loved one.